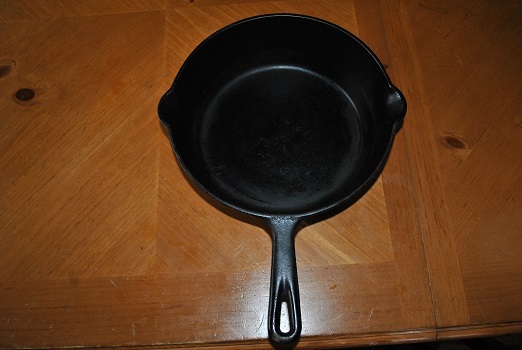 I purchased my first cast iron, a #5, which is about 5 1/2” at the bottom and 8 ½” at the top, in 1976. 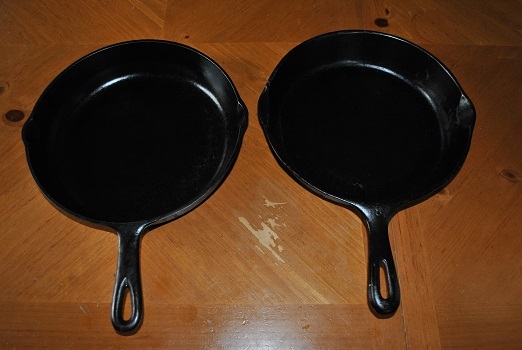 I purchased my first cast iron, a #5, which is about 5 1/2” at the bottom and 8 ½” at the top, when I transferred from William Jewell College to University of Missouri in 1976. I needed something to cook breakfast in, that could hold up to a college student. I didn’t cook too much at that time, but this gave me a good start. 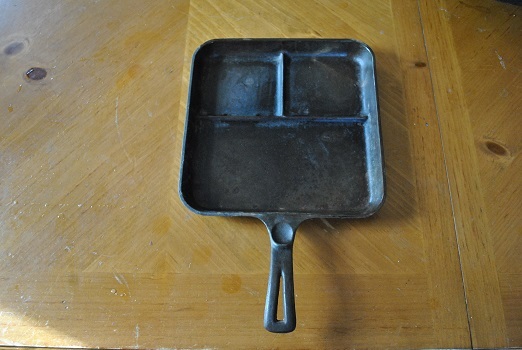 I had other pans, but none like this skillet. I soon went into telephone contracting (college dropout) after running out of money for school. Since I was on my own, and working, I use to value a good breakfast to start the day. I would get up each morning and slice up and fry potatoes and then cook eggs, as the start to the day. 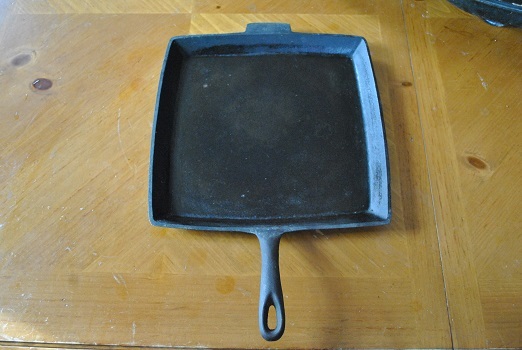 I don’t follow the same regime today, but I still have the same cast iron skillet, 42 years later. Still cooking with it. What else can you buy that will last that long and is good for you to use? 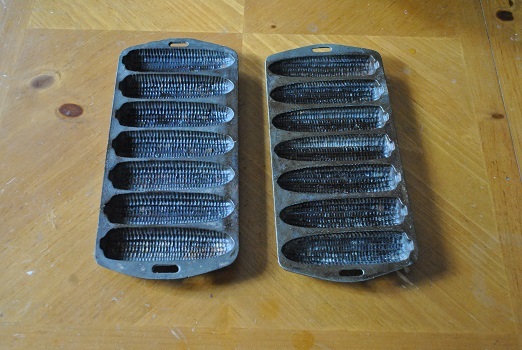 I have several cast irons that mainly came from Molly’s grandmother’s farm in Burns Kansas. Molly’s grandmother told us about how the men would come out to the farm to play cards. She did not allow card playing, smoking or drinking in the house so they played in a different house on the farm. She would cook steaks for them the next morning in the cast iron skillets, if she didn’t need it to hit someone up the side of the head with. 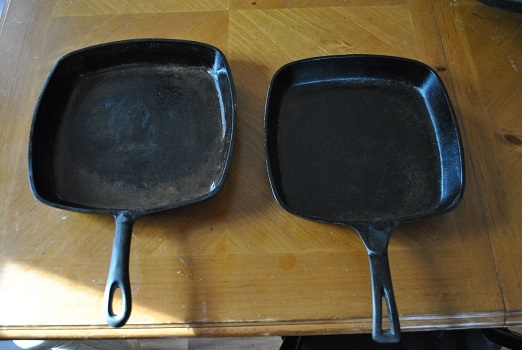 I had a cast iron raised at me a few times, well deserved I’m sure, but never hit buy one. Even though cast iron can be used to get a point across to the mule headed sort, the main intention is for cooking. 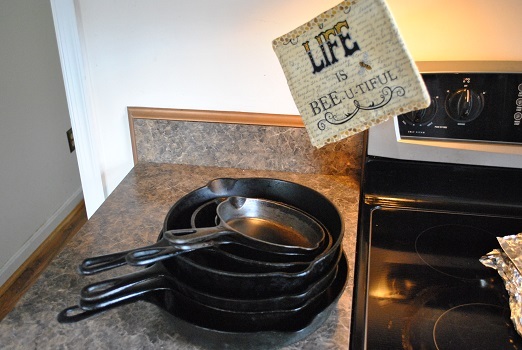 If you take care of the cast iron cookware, they can be handed down for generations. 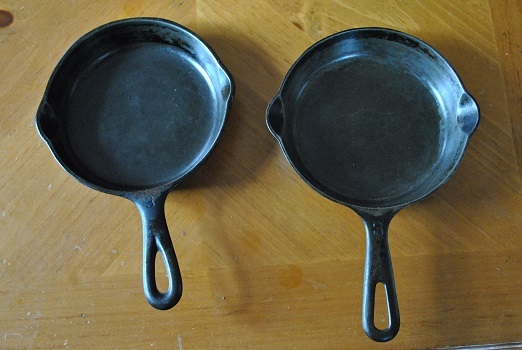 If you are starting out with new cast iron, the cast iron needs to be seasoned. You do that by wiping it down with cooking oil or lard. Then place it in the oven at a low temperature, not anymore than 350 degrees, and cook the cast iron for about 15 minutes. If you see smoke the temperature is too hot. Let cool. Do not wash!! I have never placed any cast iron in dishwater or even worse a dishwasher. The oils need time to penetrate the metal. 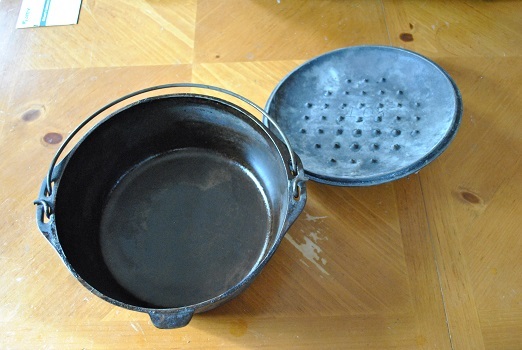 To clean the cast iron, rinse it out with hot water and clean with a nonabrasive cloth. Do not use the metal cleaning pads with soap in them. I know, you germaphobes are going yuck, where is the bleach, the comet, at the least dish washing liquid. I’m telling you, it is not needed. You just have to be sure all the food is wipe off of the cast iron, rinse, oil, put in oven if you want, and you are ready to go. I have been doing it this way for over 40 years. But if you don’t feel comfortable with this way, then go ahead and use your dish washing liquid, but that is it. 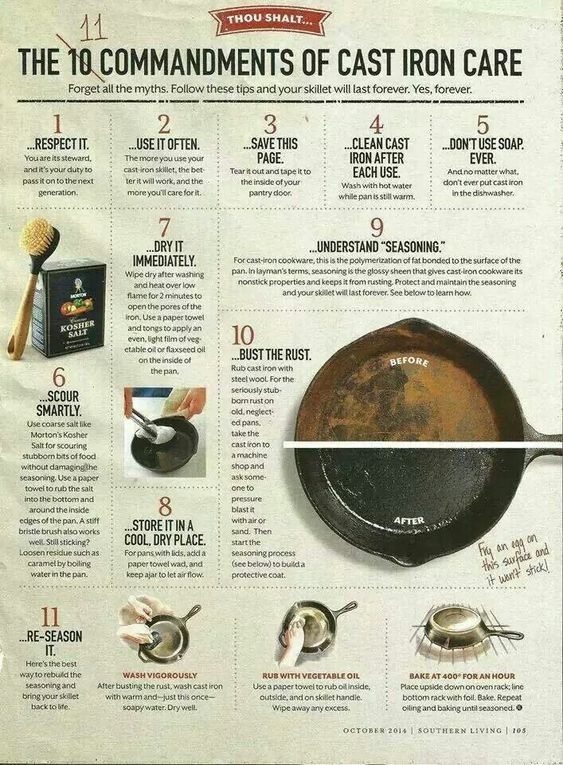 Now you have to re-season the cast iron. The more you cook with it the more seasoned it will get. Unless you cook acidic food, like pasta sauce. Tomatoes seem to just eat away at the seasoning. That is alright though, just oil it up and put it back in the oven to season again. 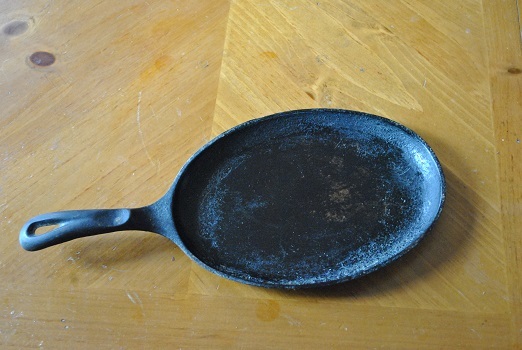 Cast iron is very forgiving, unless you leave it on the stove top with nothing in it and the burner turned up. It will warp, no names being mentioned here! Besides longevity, you have the added benefit of not ingesting Teflon. You may be thinking, but how will I cook with cast iron and not have everything stick and burn to the bottom? Seasoning the cast iron prevents sticking. The burning comes from the heat being too high. I have cooked many a corned bread without sticking or burning. I don’t even know how to fix cornbread without using cast iron. Along with not ingesting Teflon or whatever they use now a days for nonstick cookware, you will end up ingesting minute quantities of iron. Yes, what many people take a pill for, you get just by using cast iron. I only use metal spatulas or metal utensils when cooking with cast iron so I don’t ingest plastic. Remember the scare about BPA’s. They are not good for you. When I was in chemistry, we worked with phenol’s in the lab, and even back in the mid 70’s they knew they were carcinogenic. I try and use plastic as little as possible. When cooking with a plastic spatula, it wears down and you ingest that. I have seen new cast iron with an enamel coating on it. Not sure what they are good for except maybe cooking acidic food in. The enamel can chip, you don’t get the benefit of iron, but for you germaphobes, you can wash in dishwater. There is no seasoning to this type. What I cook with everyday! Cast iron can also be collectible. 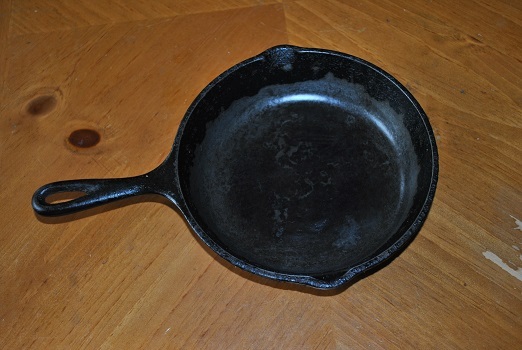 I know I have old cast iron, but I would never part with. Except one cast iron pot I used for only melting lead in. I decided not to keep that one. As you can see, I am pretty sold on cast iron. Take care of it, and it will take care of you for a long time.